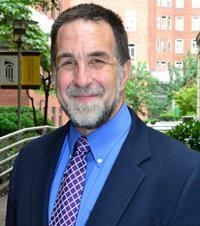 Richard P. “Rick” Barth, PhD, MSW, is professor and dean of the University of Maryland School of Social Work. He is a Fellow and President of the American Academy of Social Work and Social Welfare. His bachelors and graduate degrees are from Brown University and the University of California at Berkeley, respectively. He has also served as a chaired professor at UC Berkeley and University of North Carolina. He has authored many books, chapters, and articles on children’s services practice, programs, policy, and research. Barth is a principal developer of the University of Maryland, Baltimore-led Promise Heights initiative in West Baltimore and serves on the board of the United Way of Central Maryland, on the Governor’s Family Violence Council, on the Steering Committee for B’More for Healthy Babies, and on the board of the Furman L. Templeton Preparatory Academy. Charles Duff is a developer, planner, historian, and President of Jubilee Baltimore, a non-profit group that has rebuilt more than 250 buildings in Baltimore neighborhoods. He developed City Arts, Baltimore’s first apartment building for artists, in 2010 and is now developing two large projects in the Station North Arts District. He lectures widely and teaches at Johns Hopkins University. He is a graduate of Amherst College and Harvard University. As President & CEO of the Y of Central Maryland, John works with the board of directors to fulfill its charitable mission and achieve the vision of fundamentally enhancing the quality of life in the communities in which we operate. Leading one of the fastest growing and largest Y associations in North America, John works with an engaged group of volunteer and staff leaders to promote healthy living, youth development and social responsibility in the region.